A paper model of a virus can be made by printing, cutting, folding and taping the following images of the proteins that form the virus surface (called the virus "capsid"). The capsid images are best printed on photo paper since it is heavier than normal paper. The RNA genome for each virus can be constructed as a long paper tape with red (A), green (G), yellow (C), and blue (U) color bands giving the actual virus sequence (3000 - 8000 bases). The sequence images can be sliced on a paper cutter and the strips glued together to form a single long tape. 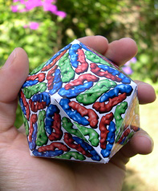 The virus model is about 2 inches in diameter and the RNA is about 10 feet long when printed on 8.5 x 11 inch paper. 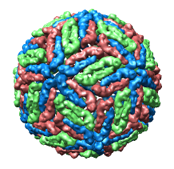 The viruses were chosen from the Virus Particle Explorer web site for their small genome size. Half infect plants. The others infect humans (polio, rhinovirus (common cold), hepatitis b, norwalk virus (stomach flu)) or other animals (foot and mouth - cows, nudarelia capensis - butterflies). Capsid images were made with UCSF Chimera using the Multiscale Models and Flatten Icosahedron tools. RNA sequence images were made with a Python script seqimage.py from a FASTA sequence file. The numbers above the genome sequence images are for keeping track of the correct sequence of cut paper strips. Twelve examples. Capsid images (54 Mb): pdf, html. Protein images (50 Mb): pdf, html. Genome images (9 Mb): pdf, html. Ribbon capsid images (55 Mb): pdf, html.